This Summer I (Chris) had the privilege of traveling to the Philippines to help lead an Internship trip with Students Living a Mission, the student missions branch of Global Outreach Developments International. I’ve been traveling to the Philippines for several years now as a member of the South East Asia regional team for G.O.D. Int’l and each time I go my trips shift more and more from simple observations and the discomfort of a foreign environment to feeling more at home on the field and being able to offer concrete benefit to the people we are privileged to minister to and with. This benefit is explicitly connected to the work that I do here in the States, both my work at Center Street Recording Studios over the last three years and my teaching at The Institute for G.O.D. Int’l for the last three semesters. I was able to utilize both of these skills I’ve been developing in the Philippines this Summer. 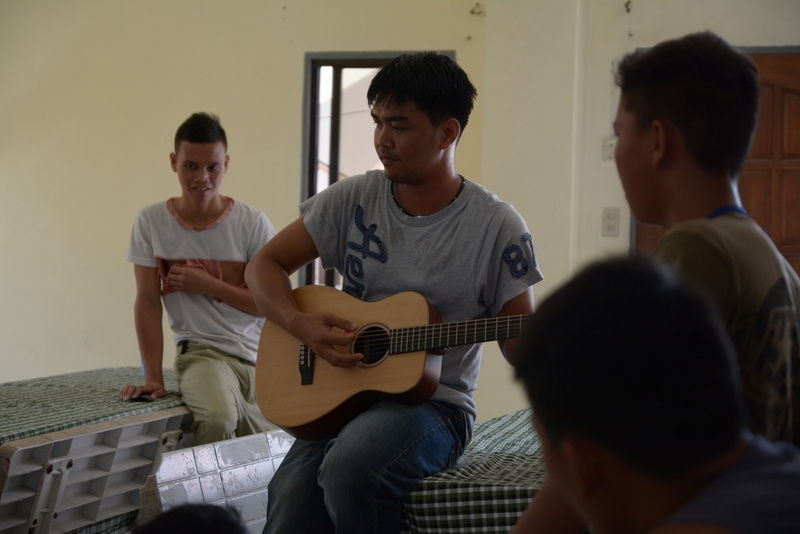 In Tacloban City on the island of Leyte, which was devastated by Typhoon Yolanda in 2013, I got to join some of our friends from the Philippines and some of our Summer Interns in facilitating a Songwriting and Recording Workshop for the youth at the Regional Rehabilitation Center for Youth. RRCY is a home for young boys in conflict with the law who are awaiting trial. It is an alternative to prison, but they are still not allowed to leave the premises and have been incarcerated without even receiving a guilty verdict. Some of the young men had been there as long as 8 years, still awaiting trial. My long time friend Richard Gowen, who has done a couple of records with us at Center Street in the States, led the songwriting portion of the workshop, teaching the basics of songwriting and using examples from some of his own original work. 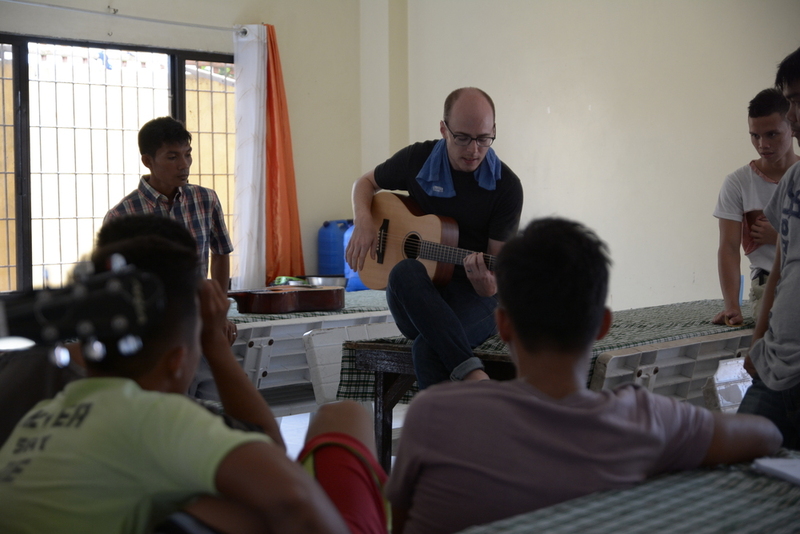 My friend Calven Poquiz, who I recorded a single with in the Philippines back in 2013, also shared some of his original music with the youth. We facilitated a time for them to write their own songs and the next day we taught them about the recording process and were able to record over a dozen of their original songs. Songwriting is a powerful tool for storytelling in the hands of people whose stories so often go untold. It is a privilege to participate in bringing to life the stories of people who have experienced firsthand the injustice of neglectful incarceration practices. Abroad, as well as here in the States, quality recording is something reserved for those who have the money and the prestige to afford it. That is a paradigm we at Center Street would like to see changed. We don’t just record music because it’s something we like doing, but because it’s something that, if treated properly, can carry a great deal of meaning. The lives of the youth at RRCY are meaningful and they have meaningful things to say from their perspectives. We hope to continue facilitating events like this in both the Philippines and El Salvador. If you would like to partner with us in these efforts feel free to contact us at 615-541-9686 or via e mail (chris@centerstreetrecording.com). Keep an eye on our blog for updates on our work abroad and all of the other wonderful things going on at Center Street Recording Studios.